Their heroic acts saved Choppies supermarket and other shops situated at the complex from devastating raids by the marauding criminal elements in the city’s western suburbs. The Chronicle yesterday spoke to some of the vendors who defended Nkulumane Shopping Complex — their source of livelihood. 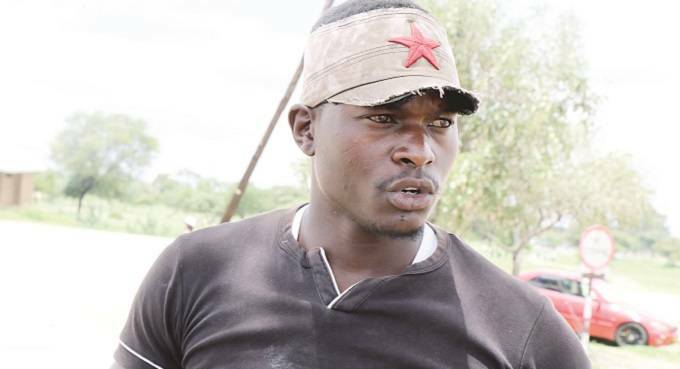 Mr Desire Chidzingwa (27) from Nkulumane suburb said he led other vendors in repelling the violent protestors as any looting would have affected them. He said shoppers who flock to the complex give them business and any disturbances at the complex also affect them. Mr Chidzingwa said numbering about 30, the vendors faced off with more than 100 protestors. “We organised ourselves to defend these shops because without them we also do not have business. “If shops at the complex had been looted all the people who were coming here would not come again. As direct beneficiaries of the shops here, we realised that looting of shops would have impoverished us,” said Mr Chidzingwa, who described himself as “Commander General”. “We just decided that each of us should buy a catapult from vendors operating at Renkini. We all bought the catapults. The gang was swelling as some of them were coming from Nkulumane, Pumula South and Sizinda among other surrounding suburbs. There are some police officers as well who we were liaising with. The cops didn’t want to advance towards the rioters who were now pelting us with stones,” Mr Chidzingwa said. “We advanced towards them pretending as if we were not armed. When we reached a shooting distance, we produced our catapults and started firing at them. Mr Chidzingwa said the running battles started on Monday and continued on Tuesday but they stood their ground preventing the gangs from gaining entry into the complex. He said on Wednesday, the protestors did not come to the complex. Mr Chidzingwa said during the skirmishes, they were able to effect citizen arrests on 26 suspects whom they handed over to the police at a base close to the complex. He said as a show of appreciation for their efforts, management at Choppies Nkulumane provided them with lunch on Wednesday. “There was no food as other shops were closed but the manager at Choppies provided all of us with lunch. The manager said if it was not for our efforts, the shop would have been looted just like what happened at Entumbane complex and other shopping centres,” said Mr Chidzingwa. He said Old Mutual, which owns Nkulumane Shopping Complex, should pay them a courtesy call for saving their building from destruction. Another vendor, Mr Watson Mabhandi, said it was everybody’s duty to defend their source of livelihood, hence their brave decision. “I don’t think there was anything wrong with people demonstrating. But it’s wrong when people start looting from shops. We sustain our families through people who buy from these shops. “We had to defend them. It’s like you, if someone tries to destroy The Chronicle, you will defend it because that’s the company that sustains your family,” said Mr Mabhandi.